Bradley J. Brewer is a 2015 Ph.D., in history from Mississippi State University with a specialization in Modern European history. To Americans World War II is all that is great about America. It represents American bravery, sacrifice, fortitude and compassion. After all it was a war worth fighting, and one that could not be avoided in the Pacific and Europe. No nation however virtuous emerges from war and the peacemaking process unscarred physically or ideologically, including the United States. On August 2, 1945 the Potsdam Conference came to a conclusion. Held at Potsdam, Germany by the United States, Great Britain and the Soviet Union in order to discuss plans for the occupation of Germany and the dispersal of reparations. Territorial issues, such as the location of Poland’s western boundary, occurred briefly but discussions were delayed until a final peace conference could be scheduled. Negotiations on territorial matters may have been delayed but the fate of millions of Germans came to be decided with the inclusion of Article XIII to the final draft of the Potsdam Agreement. Article XIII mandated that the German minority populations of Czechoslovakia, Poland and Hungary (this article only deals with Czechoslovakia and Poland) be transferred to Germany in an orderly and humane manner under the direction of the Allied Control Council comprised of representatives of the Big Three Allies. Article XIII was created for a reason. The retreat of the German army in the spring of 1945 left most of Czechoslovakia and all of western Poland to be occupied by armed forces of the Soviet Union. And within this newly conquered territory there existed millions of Germans, many of whom had lived in the Sudetenland of Czechoslovakia and the newly acquired Polish territories along the Oder-Neisse line (Brandenburg, Danzig, Silesia, Pomerania and East Prussia) since the fourteenth century. Over the years relations between the Germans and the Czechs and Poles grew quite contentious, and once the war was over citizens and government officials of both nations seized the opportunity to spontaneously and brutally rid themselves of what they saw as a troublesome German minority within their respective borders. In doing so the Czechoslovakian and Polish governments sought to expel as many Germans as possible and present the Allies with a fait accompli at a future peace conference. The unregulated wild expulsions that lasted from May through June of 1945, saw government, independent and military organizations expel 750,000 Sudeten Germans from Czechoslovakia, and 200,000 to 1,300,000 Germans from Poland. However, those numbers are an estimate and totals differ depending the study. The implementation of Article XIII was supposed to bring the wild expulsions under control. United States Secretary of State James F. Byrnes wanted to implement measures that would slow the transfer of Germans, so as to make them less haphazard and violent in nature. Byrnes was also a pragmatist and realized that the expulsion of Germans was never going to be halted completely but could at least be monitored by the Allies so that the focus of the Czechs and Poles would be on the expulsion of Germans, not the pursuit of revenge for war atrocities committed by the Nazis. After the implementation of logistical details to make the expulsions as orderly and humane as possible they began on January 25, 1946. 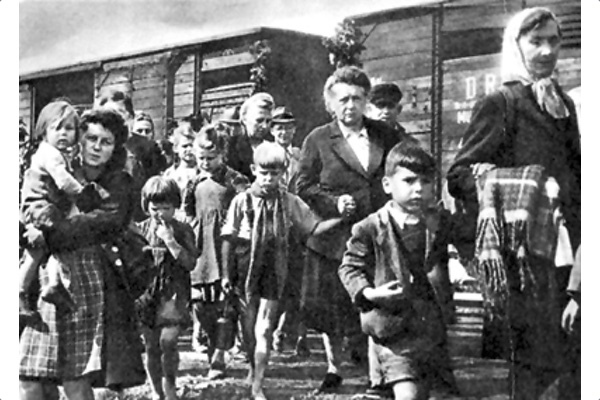 In both Czechoslovakia and Poland the post-Potsdam expulsions differed little from the wild expulsions of 1945, in that the German expellees were herded to assembly centers where they were robbed, physically abused and then crowded onto train cars and shipped to Germany, where they arrived in a state of “physical and spiritual deprivation,” according to German historian Theodor Schieder. However, conditions did improve in the summer of 1946 after Allied Control Council regulations had been fully implemented. When the expulsions came to a halt at the end of 1947 some 1,415,135 Sudeten Germans from Czechoslovakia had been expelled into the United States Zone of Occupation, along with 750,000 to the Russian zone and 1,500,000 to British zone. For the United States (and Great Britain), Article XIII was intended to establish some sense of order to an expulsion process, which was a more appealing solution to the German minority problem than the most probable alternatives, uncontrollable chaos or a probable war against the Soviet Union and Poland, which the Allies did not want to happen since they had fought a common enemy with the Soviets. In effect Article XIII legitimized the expulsions that prior to Potsdam were performed with no legal basis or consideration as to how such expulsions would impact the European demographic and political landscape. The legitimacy given to article XIII by the western Allies gave the act of population transfer by forced expulsion a legal respectability to what is in reality ethnic cleansing. Thus, the United States was complicit in legalizing the largest episode of ethnic cleansing that occurred in the twentieth century when 12,000,000 to 16,000,000 Germans came to be expelled from their historic homelands from east-central Europe from the spring of 1945 to the end of 1947. United States approval of the expulsion of Germans is both explicable and inexplicable. It was explicable in that the expulsion of Germans was probably going to happen whether the United States was involved or not, and by being a part of the process American occupation officials had some control over when, where and how the expulsions were to take place but not total control of the situation. On the other hand, United States approval of the expulsions was inexplicable and it seemed as though the removal of large swaths of Germans from their historic homelands countered the ideological base of morality and justice on which the United States was founded and ran counter to our stated war aims. In wars, where reality and ideology usually collide, the attainment of peace is more complex than the onset of conflict.